The Greens Farms Academy wrestling team poses for a photo after winning the Shelton Invitational wrestling meet on Saturday in Shelton. The team includes wrestlers from throughout many Fairfield County towns. 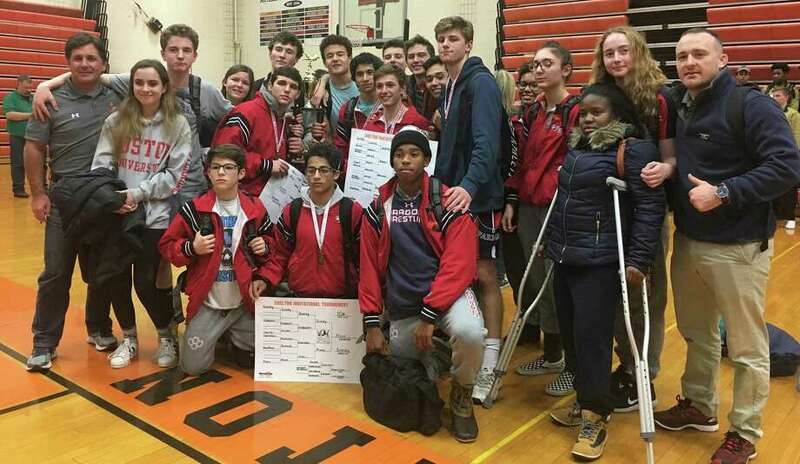 The Greens Farms Academy wrestling team went off campus to win a tournament while the boys and girls basketball teams stayed home to host its second annual holiday tournament. The Wrestling team won the Shelton Invitational while the both Dragons basketball teams placed second in their own invitational, highlighting the week in sports. The GFA Dragon Wrestling team went outside of the New England Prep School scene this weekend, and came home with a first-place trophy after winning the Shelton Invitational. The Dragons went into the tournament with several wrestlers out of action due to injury, fielding only 11 of 14 weight classes. Despite this handicap the Dragons were able to prevail., edging host Shelton by 7.5 points. The Dragons were led by three champions in the first four weight classes. Nico Provo (Stratford) at 106 pounds, Sam Stuart (Westport) at 120 and Griffin Seyfried (Westport) at 126 all won individual championships, as well. In addition to winning their respective divisions they each picked up a pair of pins on their way to victory, earning the team much needed bonus points. Also making the finals was senior Arman Ozgen (Weston) at 113 pounds. Ozgen picked up a fall in the semis before losing to a tough Shelton opponent in the finals. At 132 and 138, the Dragons fielded senior Ross Mix (Darien) and sophomore Quentin Conopask (Fairfield). Each picked up a win for the Dragons. At 145 and 152, respectively, senior captains Nick Attai (Bridgeport) and JC Foster (Darien) each turned in a strong performance. Losing heartbreakers in the semifinals, each showed tremendous heart wrestling back for third. Wrestling in the 160-pound weight class, Kevin Maldonado (Norwalk) picked up a pair of wins, again adding to the team victory by earning much needed bonus points. Senior Conrad White (Fairfield) wrestled well and was able to make his way to the consolation finals at 182 pounds. Rounding out the GFA lineup was Adler Viton (Greenwich) at 195 pounds, who grappled his way to a strong third-place finish. The Dragons return to action in two weeks at the Prep Slam, a national tournament in Atlanta Georgia. GFA opened its holiday invitational with a 64-38 over Harvey on Friday night. A balanced attack led to the victory as GFA used its entire bench in the game. Henry Holzinger (Westport) led the way with 12 points while David Basich (Westport) added 11. Teddy Brown (Greenwich) chipped in 9, Max Mitchell (Westport) had 8, Jack Ramsay (Darien) had 7 and Jack Seegers (Stamford) added 5 more. TJ Halloway (Orange) added four while Brady Reynolds (Wilton), Kobi Agard (Norwalk), Jackson Boolbol (Greenwich) and Bennett Close (Norwalk) all had two. Two starters -- Greg Lawrence (Fairfield) and Cole Prowitt-Smith (Fairfield) -- did not play. Ramsay and Mitchell had nine rebounds each while Brown and Holloway picked off eight boards each. In the championship game, the Dragons had two opportunities to either win or tie the game, but missed both allowing Hyde School of Maine tp take a 60-58 win over GFA in the championship game on Saturday. Lawrence (23 points) and Holzinger (21 points) combined to score 43 of the Dragons' 58 points, but it wasn't enough as Hyde put four players in double figures. Basich added nine points for the Dragons while Close had three and Teddy Brown two. Lawrence also had 10 rebounds and five assists for GFA. Earlier in the week, during an FAA game, the Dragons fell behind by 16 at the half and simply couldn’t claw their way back into it, suffering a 79-64 road loss against a very talented Hamden Hall team. Holzinger scored 17 points for the Dragons while Mitchell added 14 and Lawrence 13. Close added nine more. In a busy week that saw the team play five games in seven days, the Dragons went 2-1 in their own tournament to finish as runners-up to St. Andrew’s. St. Andrew's raced out to an 11-0 lead and GFA was never able to recover as the visitors from Rhode Island won the 2017 GFA Dragon Invitational Holiday Tournament. Freshman Georgie Grabowski (Stratford) led the Dragons charge with 10 points while Katherine Marcus (New Canaan) added five more. Sarah Peltier (Stamford) and Kelly van Hoesen (Greenwich) added three points each while Elyse Kimball (Easton) and Harriet Wells (Westport) both scored two points each. Van Hoesen grabbed 12 rebounds for GFA while Grabowski and Hannah Kozdeba (Shelton) picked up five boards each. Against Millbrook in the tourney opener, van Hoesen notched her second straight double-double to lead the Dragons to the 46-28 win. Van Hoesen scored 10 points and had 12 rebounds to pace the GFA effort. Grabowski added 11 points while Marcus, above, had 10. Marcus also had eight steals and four rebounds and Grabowski had four steals and two boards. Another balanced scoring attack led the Dragons to a 42-28 win over King in the second round of the Dragon Invitational Holiday Tournament. Grabowski netted 10 points for the winners while Marcus and Peltier had eight points each. Van Hoesen tallied seven points while Bella Litt (Darien) had six points. The Dragons led 18-14 at the half before turning it on in the second half. Van Hoesen had 11 rebounds for GFA while Grabowski picked off eight boards to go with four steals. Litt added seven rebounds and three steals. During a regular season match-up against King earlier in the week, a big second half and a balanced scoring attack led the Dragons past King on Monday by a 43-22 score. Grabowski's 11 points led the charge for the Dragons while Kozdeba added 10 points. Marcus tallied nine more. Van Hoesen added seven rebounds, three blocks, three steals and two assists while Kozdeba had six boards. On Wednesday, the Dragons let a nine-point lead slip away late in the second half, falling to Rye Country Day by a 49-47 score. Grabowski scored 18 points while van Hoesen added 10. Van Hoesen also grabbed 10 rebounds. After falling in the top two spots -- without its top two players -- the Dragons swept the rest of the match to earn a 5-2 win over King. Will Mackle (New Canaan) won 11-7, 11-5, 11-6; Blake Newcomer (Greenwich) won 11-1, 11-5, 11-3; Giani Panariello (Westport) won 11-5, 11-4, 11-3; Will Sarbinowski (Darien) won 11-0, 11-2, 11-3; and Patrick Howard (Darien) won 11-0, 11-6, 11-8. The Dragons fell to a powerful Hopkins squad 7-0 earlier in the week. Duda Voldman (Stamford) was the only GFA player to take a game off of his opponent. The Dragons earned their first win since February 11, 2016, with a 6-1 win over King. Katie Mackle (New Canaan) won a well-earned five-set battle at the No. 1 slot, pulling out an 11-7, 11-6, 10-12, 7-11, 11-3 win. Charlotte Cohen (Westport) went four sets to earn a 4-11, 12-10, 11-6, 11-3 win. Clare Foley (Southport), Lucy Nelson (Westport) and Julie Edwards (Westport) won in straight sets, 3-0, while Annabella Kreitler (Fairfield) won by default. Later in the week, the Dragons battled tough against Greenwich Academy, but fell 7-1.
coasted to a straight-set 11-2, 11-2, 11-3 victory over her opponent and No.1, but the rest of the Dragons battled hard in defeat to Greenwich Academy last week. Cohen was the only other Dragon to take a set, falling 11-7, 11-6, 6-11, 11-7. All told, though, the Dragons took 140 points in the match.